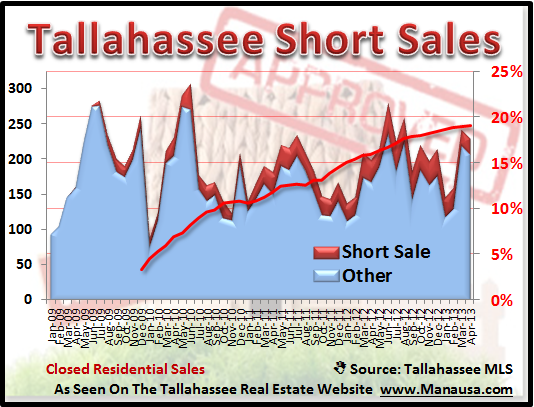 After seeing positive movement for home values in yesterday's Tallahassee Real Estate Report, I had a reader ask me about the current trend for Tallahassee short sales and how they might affect the market moving forward. I would think that a decline in Tallahassee short sales could be a sign that we have reached (or are closely approaching) the peak of the distressed property liquidation, while the opposite could suggest that continued pressure on home values remains the trend. The real estate graph below shows all home sales recorded in the Tallahassee MLS from January 2009 through the end of April 2013. The blue shaded area measures closed home sales that were not short sales, while the red shaded area measures closed home sales that were "short." The one-year trend of the ratio of Tallahassee short sales to all closed home sales is shown with a red line and is measured on the right vertical axis. Unfortunately, this means that the trend for short sales in Tallahassee is still rising, and we have not seen the peak of the market for distressed home sales. My advice to homeowners who are upside-down in their homes, but want to move is to take a close look at the short sale process. For the many clients that we have helped go through a short sale, I can tell you it was a blessing. While nobody likes selling for a loss, the deals that banks are still approving make doing a short sale a smart solution for many people. But I do think time is running out. There will be a shift in the balance of "power," when banks decide they will no longer approve short sales and sellers will be held accountable for the full amount that they owe. This will occur when values begin to approach levels last seen in 2008 or so. My recommendation is to do your research now. 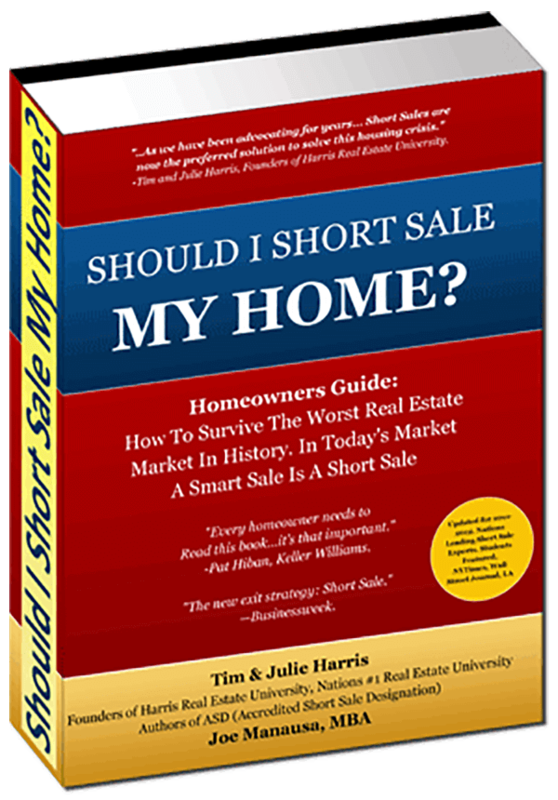 Read the e-book (Should I Short Sale My Home?) and make an educated decision on your best course of action moving forward. And if I can help you with deciding whether or not your home should join other Tallahassee short sales, just make contact with me and we can schedule a time to review your specific situation and needs.